"I've been dreaming of this opportunity since the mid-nineties, a distribution platform for screen-based digital work," explains San Francisco Bay Area based media artist Scott Sona Snibbe, "It's why I abandoned doing this work in the mid-00s, because of a lack of a distribution model. [It] seemed silly hacking apart laptops to put on the wall." This quote exemplifies the reasons why the iPhone and iPod Touch have become key instigators for driving media artists to revisit their past work and release new versions for the devices. 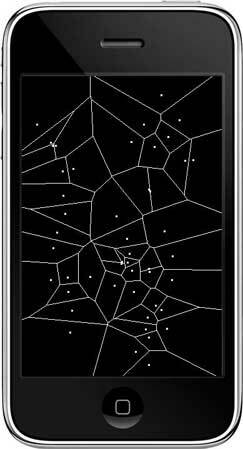 Snibbe has since released three "Apps" for the devices, including Gravilux, which was originally written for desktop computers back in 1998 and now exists as a free app that produces a starscape from thousands of small points that can be dragged around and played with using multitouch points on the screen. Gravity can be customized using the settings as well as heat amounts, antigravity, and the total amount of stars that are displayed. Snibbe's other classic software piece, Bubbleharp (1998) is also available as an app and allows for the user to drag their finger across the screen to create cell-like bubbles on the screen that animate based on the path the user moves while creating them. This work is an organic display that resembles the natural movements of single-cell organisms squirming around a petri dish. 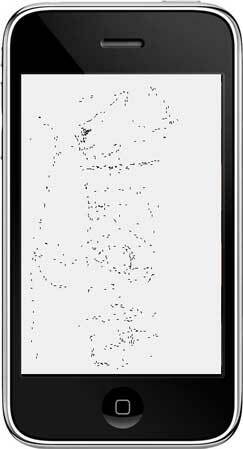 Finally, Snibbe's Antograph exists as a drawing program that allows for the user to create a trail of crawling ants on the screen that move based on gestural input. The result is a generative drawing system that comes alive during and while using it. Snibbe sees his apps as methods of adding simple snippets of meditation into our often super busy lives. "There's a great place for apps that are a one-shot "cool" "demo" experience, but what I'm after is something more inspired by the history of abstract animation [such as the work of] Len Lye and Oskar Fischinger. To create something with a connection to a deeper part of your mind and an infinite explorability. Also, to create a special effect on your mind. Even something you might do each day when you come home from work to relax! ", Snibbe explains. Also experimenting with enabling users to draw into 3D dimensionality on the iPhone is Amit Pitaru, a Brooklyn-based media artist and classically trained musician. Pitaru has ported his interactive installation Sonic Wire Sculptor (SWS) to the iPhone with help from artists Zach Gage, Zach Lieberman, and James Patterson. SWS uses the phone as a canvas for creating 3D, rotatable drawings that generate sound based on the position of 3D lines on a floating scale. Changing the height of the line changes the pitch of the tone played and the location of the drawing (right or left of the screen) changes which earphone (left or right) you will hear the sound. The sketches can auto-spin, be rotated, and be manipulated while they are playing to achieve different sound effects. Scales range from pentatonic to C and enable the creation of textured, tremolo and various other effects. The Fragmental Storm and Joiner apps by the Japanese artist duo Exonemo examine the deluge of available data on the Internet and seen through the camera lens by using sound and imagery in a collage-based context. Creating internet art since the early days of the web in 1996, this Tokyo based group of Kensuke Sembo and Yae Aikawa pride themselves on building acts of "technological terrorism" into their artwork such as their early work Discoder (2000) that received an honorable mention at Ars Electronica. This piece encouraged users to download a website and create alterations to it with keystrokes whose resulting output resembled the effects of a virus on the digital information, thus ultimately destroying the site into a deteriorated state. Fragmental Storm continues in this tradition but uses the iPhone's unique location-aware capabilities as well as its Internet connection to create a chaotic collage of imagery based on user selections. When launched, you can choose to create a collage from imagery based on your current location, a search of the web, or images from the artists you are currently listening to on your iPhone. The result is a music video of sorts or chaotic realization that mashes together a conglomeration of photos, websites, and Twitter feeds from any of these scenarios. Although hard to watch at times, the resulting collage is a reminder that data is constantly both available to us and inhabiting our current location whether or not we desire to access it. Exonemo also uses the iPhone to remix live photography with their Joiner app. Joiner uses the camera to collect snapshots of still imagery from multiple locations and allows the user to create a dynamic collage by touching the screen. The result is a still from wherever the camera is pointing, mixed with the next still from a different angle or subject. Overall, Exonemo's apps provide chaotic but also highly visceral and lush reactions to the data and environment around the users themselves. Moving away from chaos and into the world of gaming and imagination are two apps from Tale of Tales, the Belgian-based artist duo of American, Aurea Harvey and Belgian native, Michael Samyn. Described by the duo as "a memento mori for your digital hands", their app, Vanitas, is a simulation of a small wooden box that can be slid open with a swipe of the finger. Inside are objects such as a skull, pen, flower, dice, feather, bubble, book, seashell, and more that exist as objects of reflection and small keepsakes that would normally be hidden away in an attic or jewelry box. Vanitas brings the idea of personal treasure and meaningful objects to the often cold world of mobile apps where utility and function are typically more important than emotion or private sanctity. 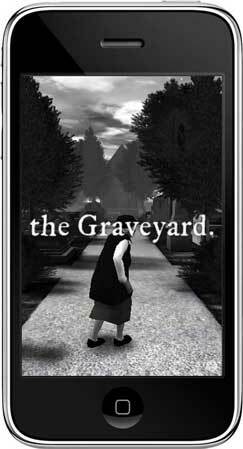 Similarly, The Graveyard, a mobile port of their PC-Based simulation, allows the user to control an old woman on a journey through a typical graveyard scene to eventually sit on a bench, rest, and observe the ambience. Created in 3D and in black and white, the lighting effects along with gentle winds and passing bird flocks, give The Graveyard an eerie sense of inhabitance. The point of the piece? Simply to experience a location and state of mind of an elderly woman strolling through her potential future home. 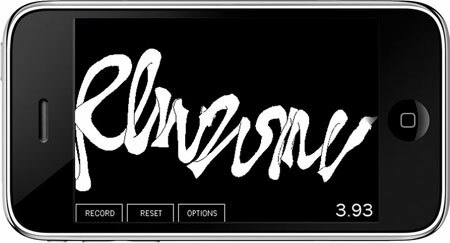 From reflection to art production, evolving his work on the Graffiti Analysis (2005) application, artist Evan Roth has taken the software one step further and ported it to the iPhone. With a simple finger motion, users can create graffiti on the screen and rotate their designs in 3D to see how they were spatially created. The app syncs user creations to Roth's Black Book website: 000000book.com, uploads the design and saves out the tag as GML code (Graffiti Markup Language) which can then be used for other applications. This form of instant sharing is something integral to the Internet and now with connected mobile devices, the opportunity to join a larger community of users can be built into apps that support this type of interaction. 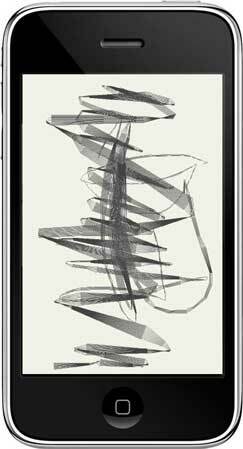 Also using the device as a drawing tool in the traditional sense, media artist David Lu's Vellum app combines a traditional charcoal scratching style with the iPhone to allow for more expressive creations to come from simple gestural input. Vellum is more of a traditional artist app for artists who long to use non-digital tools in digital ways, such as mimicking charcoal drawing on paper. Lu explains his motivation behind creating the app and his curiosity about the future of artist-made apps for the store. "I was interested in the act of drawing on a touchscreen. How could it be made simpler and more natural? In the real world, drawing on the go is simple and straightforward; one typically carries one or two tools, and perhaps a small Moleskine or other notebook. An iPhone equivalent didn't yet exist. 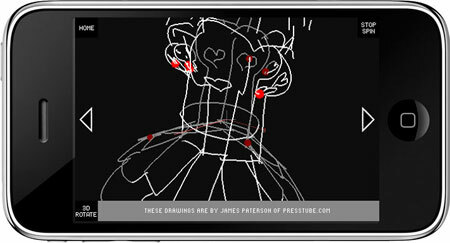 The typical drawing app for iPhone deluges the user with tools, options, menus, and choices. These things get in the way. My solution was to remove choices, presenting the artist with a minimal, tightly edited set of tools. Ones that use finger velocity to influence qualities of one's marks, eliminating the need to open a menu and drag a slider. 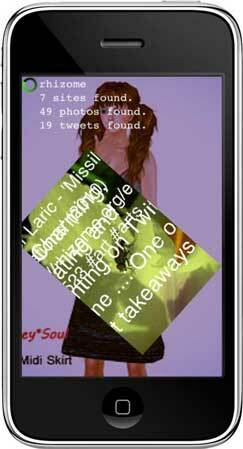 I also wanted to test the App Store market for creative apps." Creating music from artistic creations such as painting is something that artist-made desktop software has attempted to do over the years. Following this lead, Abstrakt, created by a team of students from the ENJMIN Graduate School of Games and Interactive Media in France, is a free app that enables music composition by manipulating elements of paintings inspired by three famous artists of the 20th century: Paul Klee, Wassily Kandinsky and Piet Mondrian. 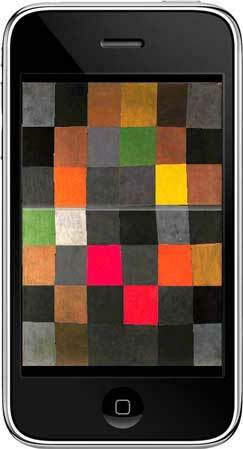 The grid-based theme of Mondrian encourages users to tap on colored squares of the on-screen painting. Once tapped, they become highlighted and a thin bar passes over them. Every time the bar crosses a highlighted square, a tone is heard through the speakers. By selecting several bars, the user can create an instant drum machine effect on the timeline, enabling the painting to come to life as a built in sequencer that gains in intensity for every highlighted block. This simple act of sound creation through touch input is something that more artists are integrating into their apps and it seems like a good starting point for those who are interested in learning more about creating apps. As the iPhone and iPod Touch become more saturated into a population of people who never would have used their phones for anything other than making calls, it seems as if the chance for artists to create new work for the devices is becoming more commonplace and accepted. Even commenters in the AppStore have good things to say about art showing up in this context. One person said this of Snibbe's Antograph, "These apps are amazing and point the direction for the future of art, science, and technology. Soon these "ants" will be making music, operating on people, and stopping oil well leaks. What a great time to be alive." Another commenter hinted at the seemingly non-purpose of the Vanitas app, but how the design was still compelling enough for multiple visits, "Make no mistake, Vanitas is not a game even though it's made by a "game" company. There is no goal, no discernible narrative so - what is it? It's interactive entertainment. I found it terribly addicting." Maybe these forms of contemplative apps made by artists is exactly what is needed to change the driving force of the App Store and the ways in which mobile apps are marketed in the first place. Despite the rhetoric of Apple controlling access to its store and the apps featured there, overall, the mobile platform of the iPhone has begun to enable artists to get inspired to both revisit their old screen-based work and discover new forms of interactivity that these new platforms now enable. Jonah Brucker-Cohen is a researcher, artist, and writer. He received his Ph.D. in the Disruptive Design Team of the Networking and Telecommunications Research Group (NTRG), Trinity College Dublin. He is an adjunct assistant professor of communications in the Media, Culture, Communication dept of NYU Steinhardt School of Culture Education and Human Development at New York University and also teaches at Parsons MFA-Design / Technology. His work and thesis focuses on the theme of "Deconstructing Networks" which includes projects that attempt to critically challenge and subvert accepted perceptions of network interaction and experience. His writing has appeared in numerous international publications including WIRED Magazine, Make Magazine, Neural, Rhizome, Art Asia Pacific, Gizmodo and more, and his work has been shown at events such as Transmediale (02,04,08), ISEA (02,04,06,09), Institute of Contemporary Art in London (04), Whitney Museum of American Art: ArtPort (03), Ars Electronica (02,04,08), ZKM Museum of Contemporary Art (04-5), Museum of Modern Art (MOMA NYC)(2008), and the San Francisco Museum of Modern Art (SFMOMA) (2008). Thanks so much for the run down on these apps. I think the meditative types are especially interesting since there's nothing really like that in the app store. Reading your thoughts on the potential for wider interest in artist apps, reminds me of the 1980s when there was tremendous enthusiasm in the art community for the possibilities offered by the arrival of cable television, which opened up the distribution network for artists working with video. Then as now, it's the audience that lags behind, needing a bit of an education to appreciate the outside-the-box ideas/play/work that artists do. For further discussions on mobile art and mobile filmmaking FILMOBILE (www.filmobile.net) might be of interest.